Austria is one of the most beautiful countries in the world and yet it gets overlooked by travelers every day. Did you know that the Sound of Music was actually filmed in Austria (in Salzburg actually(!) full travel guide here) That should be reason enough to plan your next vacation to Austria. This gorgeous country is full of striking peaks, sprawling glaciers, and quaint yet stunning towns. It is the perfect place to visit year-round with superb weather in the spring and fall, mild but sunny summers, and perfect wintery landscapes to gawk at (and maybe ski down). There are numerous absolutely stunning cities to visit and I wish I could include them all but this list can't go on forever. 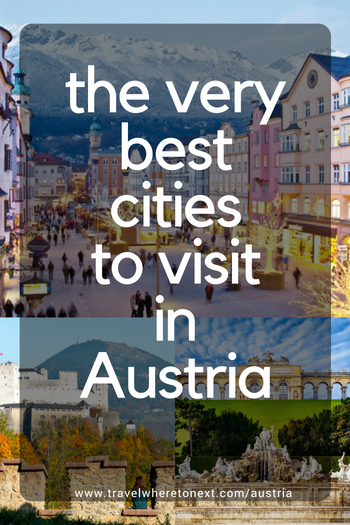 So, here's a small start of the best cities to visit in Austria. Many people call Salzburg one of the most beautiful cities in all of central Europe. And the best part? It's great year-round. That's why Salzburg tops my list of the BEST city to visit in Austria. The historic city has 12 centuries of history to discover and a well-preserved Old Town that is on the UNESCO World Heritage list. Salzburg is absolutely beautiful in the spring but it's a real stunner in the winter. Don't miss Hohensalzburg Castle, the largest medieval castle in Europe, the rolling hills outside of Salzburg - where the Sound of Music was filmed, and the birthplace of Wolfgang Amadeus Mozart. I visited Innsbruck by luck during my first backpacking trip to Europe. We picked it simply as a convenient stop between Munich and Venice. Boy were we glad we stopped there. It's a stunner. We came in the summer and were able to take the gondola up into the Alps for amazing views. If you visit in the winter you'll have your pick of winter sports, Innsbruck actually hosted the Winter Olympics in 1964 and 1976. The old town is stunning as well and was meticulously reconstructed after heavy bombings in WWII. Vienna is probably the most well-known place in Austria and for good reason. You can visit the Imperial palaces such as the Habsburgs' summer residence Schönbrunn. Check out the famous museum quarter which is always hosting street fairs, museum galleries, lined with coffee shops, and cake shops of course. Vienna is a city filled with music and you would be remiss to leave without visiting the opera house or any classical music venues. Basically, Vienna is awesome and you shouldn't miss it! You've probably seen this town on social media. It is constantly used as a stunning wanderlust-inspiring backdrop for many accounts. In fact, it's so beautiful, China actually built a full-scale replica! The lake and town are a romantic setting in any season and is a must visit in my book. One of the tiniest towns on the list, Alpbach is actually pretty well-known for its quaint size. It was voted the most beautiful village in Austria in 1983 and 10 years later was named the most beautiful floral village in ALL of Europe. It is fairly isolated, but thanks to Austria's excellent train system it isn't too hard to reach. The town has a great ski resort as well, and is one of the best places to ski in the Alps if you are a beginner. I know that 'ski cities' is a bit vague. But, skiing anywhere in the alps is a true bucket list experience and there are a couple of places to do that in Austria. One of the most beautiful places in the world to do that is in St. Anton, but I will say that it is a bit more advanced. 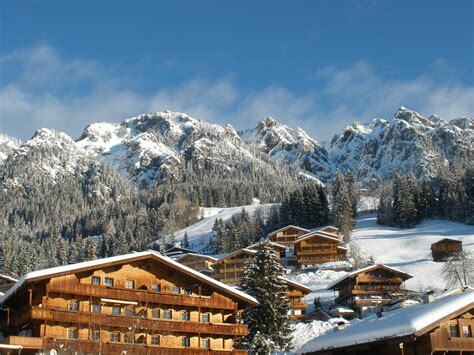 If you want somewhere a little easier check out Alpbach or Saalbach. Another great place is Innsbruck! I've been there (over the summertime though) and can attest to its beauty! You'll find well-groomed slopes in Austria open from November to April for you to enjoy. Read on: Guide to Skiing in Austria - Including What to Pack! Listen up, this is the hidden gem on the list. East Austria is a fertile wine country that is a bit different from the rest of the (also gorgeous) country. The sunny weather and numerous taverns (known as Heurigers) will give you a trip of a lifetime that you'll never want to leave.